Finding the right baby crib sheets comes down to a lot of factors. First, you want to test your child for skin sensitivity, as some sheets contain harsh dyes and chemicals that might irritate your child. Then you want to find a style and color that suits your baby room decor. There are a rainbow of colors and designs to choose from. Next decide how much you’d like to spend. You can literally spend a fortune when it comes to buying baby sheets, or you could spend very little. If you’re not interested in thread count, but more so in finding something that is economical, then you should be able to find a number of sheet sets to suit your budget and preferences. It really comes down to what you think looks cute, and what makes your child feel cozy. 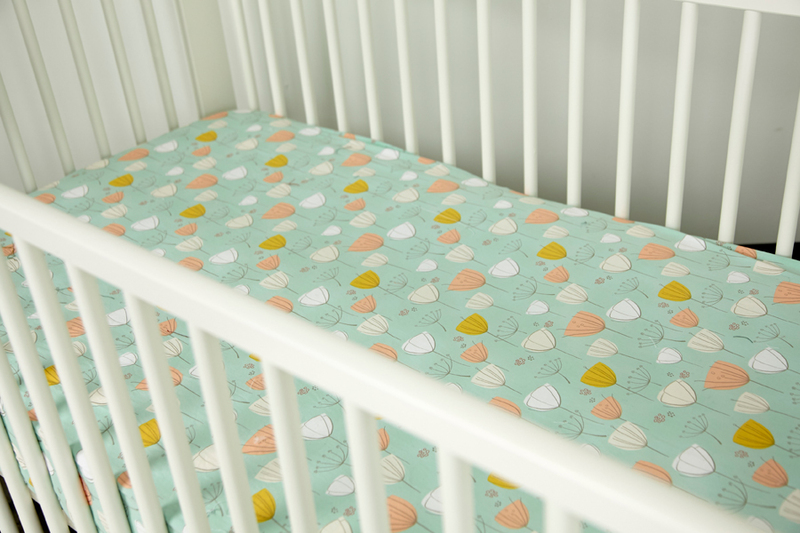 These comfy baby crib sheets are 100% organic and made from the softest cotton im-aginable. This set fits a standard size of 28 x 52, and works well for either cribs or todd-ler beds. They are natural in color, so they’re suitable for most baby room decor, and are completely free from dyes, bleach, and pesticides, making them ideal for babies with even the most sensitive skin. The 3 panel construction features deep 9” corner pockets for a secure and smooth fit. It’s easy to wash these sheets in the washing ma-chine with cold water and with other colors. Be sure to use mild detergent and wash on the gentle cycle. You’re also going to want to tumble dry low to ensure that these sheets maintain the proper size. 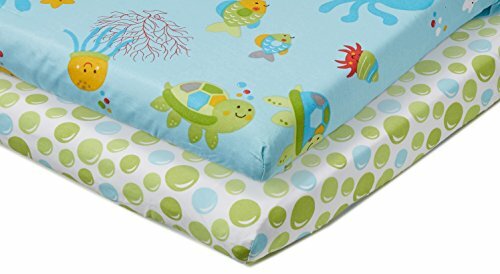 For the most part, these are fantastic sheets when your baby is sensitive but you still want to give them the lush comfort that other sheets provide. The fanciful ocean dreams design really makes these sheets stand out from the rest. You get everything that you need in this set to fully make your child’s bed, and the sheets are incredibly cozy and soft against baby’s skin. The sea green, light blue, and white colors add a touch of beauty to any baby decor, and the colors are suitable for either boys or girls. These sheets are designed to fit a standard crib mattress, and the fabric blend is 55% cotton and 45% polyester. Be sure to wash these sheets separately in cold water and on the gentle cycle to maintain their colors. Only use chlorine bleach when absolutely necessary. It’s also important that you dry them on low heat, and iron only when necessary. All in all, these are delightful sheets that add a beautiful touch to your baby’s room, and they’re sure to sleep tight when wrapped up in these soft sheets. 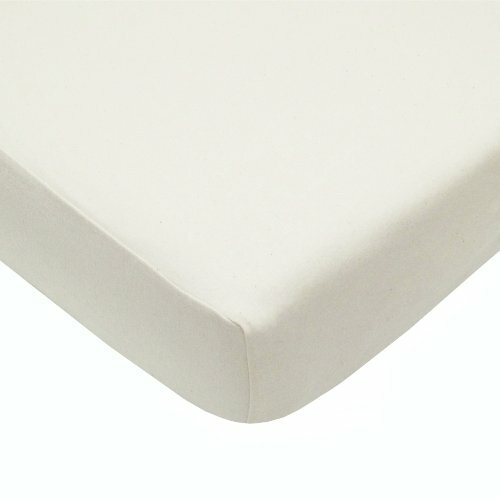 These sheets are incredibly soft against baby’s skin, and the fitted design will always hold snuggly to the mattress. The texture is similar to that of a jersey knit sheet, and it’s very comfortable against even the most sensitive skin. 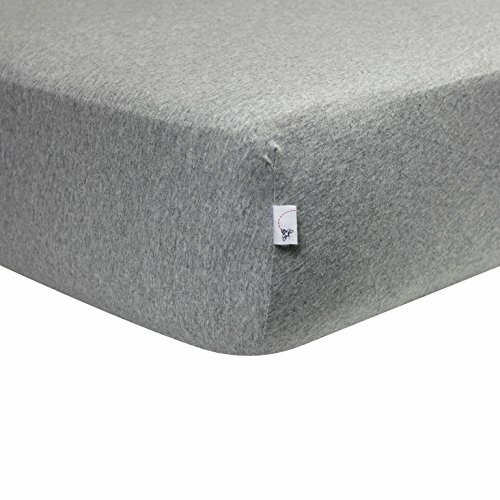 It’s got a lot of stretch to it, so if you have a thicker crib mattress it should be able to wrap around the extra depth. The garden print is incredibly cute, and adds an extra touch to your baby room decor without standing out too much. The design does not fade when you wash it, but it’s still a good idea to wash on a gentle cycle and with cool water. This design really works well for either boys or girls. The good news is that these sheets seem to just get softer and softer over time, so don’t be afraid to throw them in the wash a couple times a week, or as needed. This is a wonderful addition to your baby’s room, and also makes for a great baby shower gift.